Today was the Newbury RC hill climb on Walbury Hill. Back to domestic time trialling in the UK, and there was not quite as much glamour driving down the A34 towards Newbury, but it was a great Autumn day and super views from the top of Walbury hill. I’ve spent two weeks in NY. 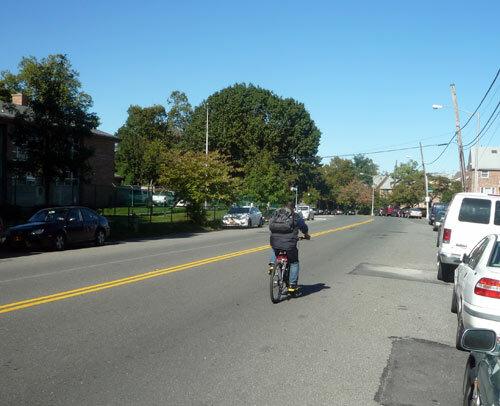 I did a little training on Dougleston Parkway – a short hill, which takes 1.30 if you really go for it. It’s a bit like Monsal Head, except instead of the beautiful Peak District, you have as a backdrop – innumerable concrete flyovers, a smelly sanitation dump and cars driving like only crazy New Yorkers like to. Quite often you get the passing draft of a big smelly dumpster truck, though the benefit of the passing draft is negated by the nervousness about breathing in within a 20 foot radious. Refuse collection is essential for any city – it’s just that we don’t tend to do high intensity intervals next to it. Still, I got four good training sessions in during the 12 days. Just about enough to feel I didn’t fall behind in the general scheme of things. 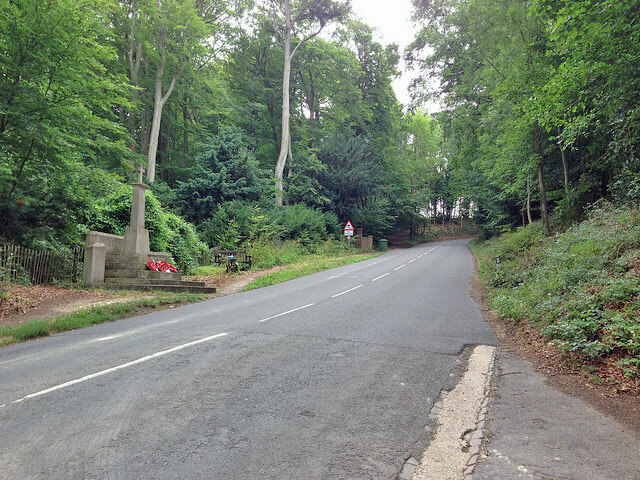 I last rode Box Hill in 2012, a few days before the London Olympics. It was a memorable time for British sport and cycling in particular. I’d been looking for an excuse to go back. Simon Warren’s guide of S.E. England climbs showed quite a lot of climbs around Dorking I haven’t done before. 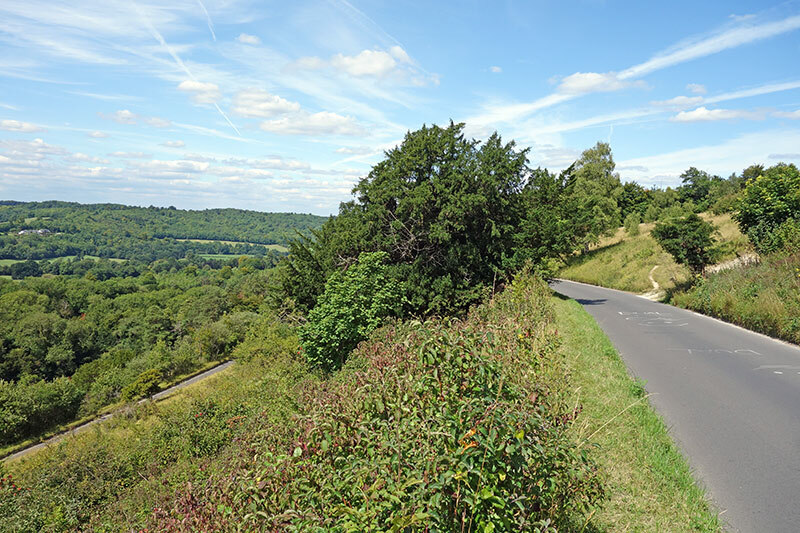 After Yorkshire hills last week I was on a roll for finding new climbs so good weather encouraged me to drive an hour from Oxford to Mickleham to try and range of different climbs on the Surrey downs. First climb of the day was Box Hill. Everyone knows Box Hill now. 2 miles @ 5% It’s a beautiful climb, it’s iconic, it’s wonderfully engineered and a delight to ride. 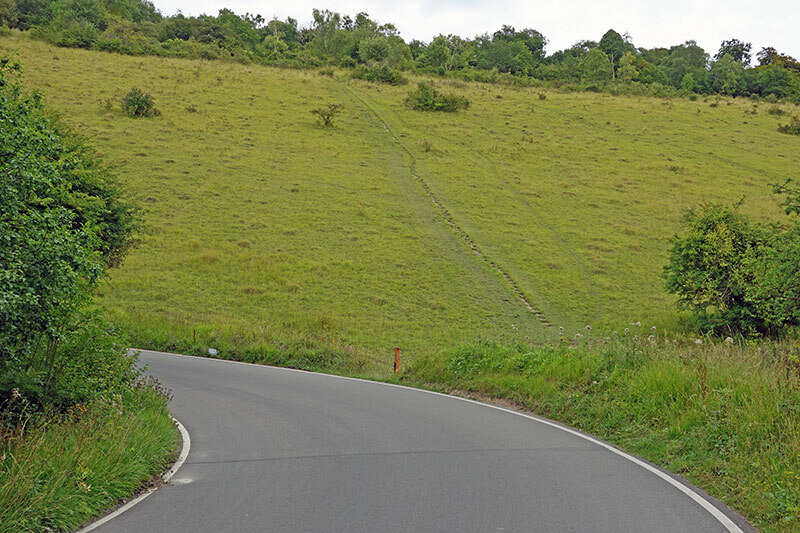 Yet, there’s the Yorkshire Hill climber in me who sees this wonderful natural hill and thinks – wouldn’t it be better just to throw a few cobbles up this surface and make a hill that goes straight from bottom to top? 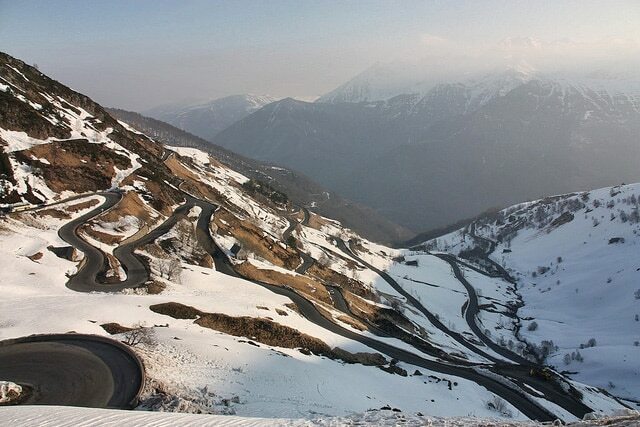 If this was West Yorkshire, they wouldn’t have bothered with these ‘European hairpins. But, made a proper hill climb. 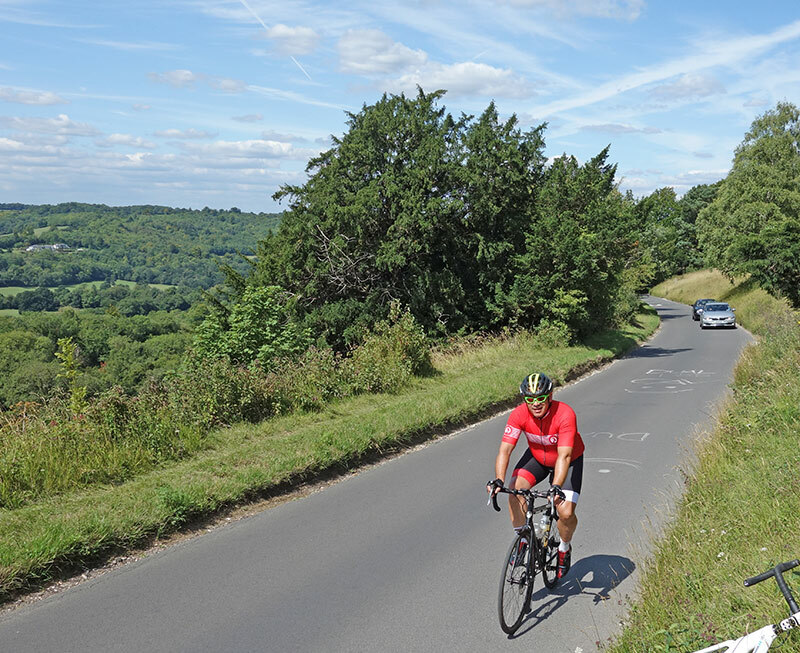 Having said all that, I was worried by a sign at the bottom of Box Hill – warning of loose chipping – max 20mph, but fortunately, they haven’t chucked a load of gravel on the smooth surface of Box Hill yet! Trooper Lane is a short, steep cobbled climb in Halifax. 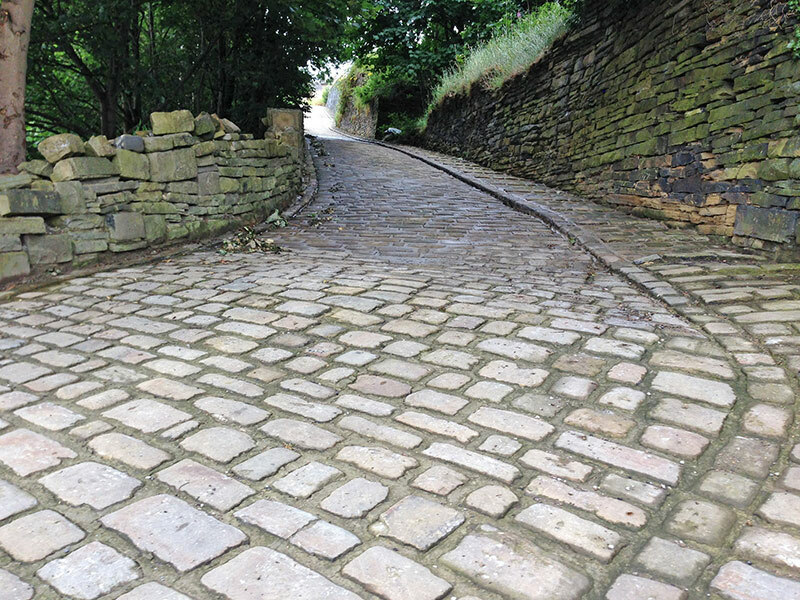 It makes a good claim to be the toughest cobbled climb in the Yorkshire area – possibly the whole of England. With contenders like Thwaites Brow, this is tough competition. 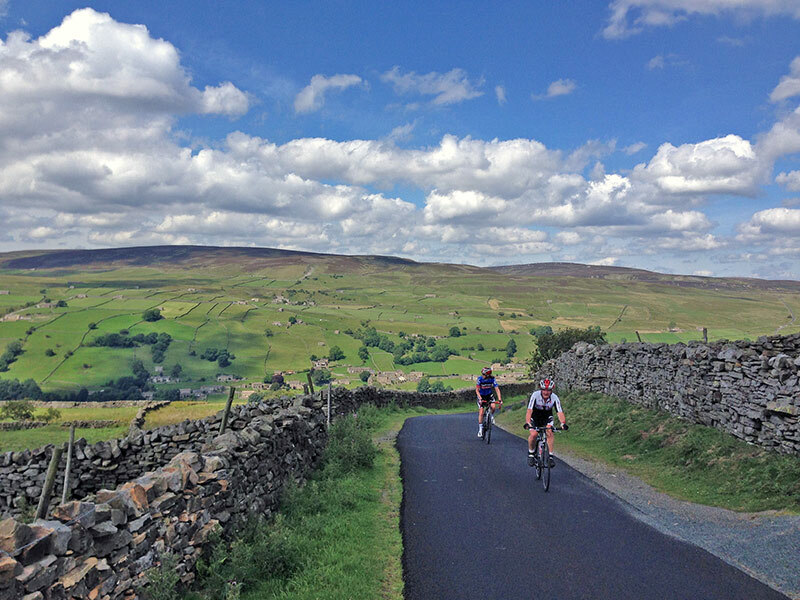 I saw Trooper Lane on the Cycle Show a few weeks ago, with Simon Warren going up and describing the climb. I have also been reading James Allen’s 50 Classic Cycle Climbs in Yorkshire / Peak District, which includes Trooper Lane. So it was definitely on my bucket list of stupidly hard climbs, that for some reason I feel a compulsion to seek out and ride up as fast as possible. Today was good weather in the Yorkshire Dales so I drove out to Kettlewell and headed off for some of the big Yorkshire climbs. 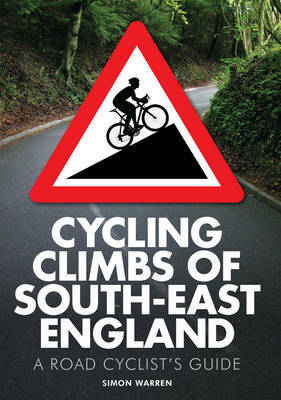 Cycling Climbs of South East England is the first of the regional guides to road cycling hill climbs in England. It follows the same format as the best-selling 100 climbs. In fact the regional guide includes 50% of the hills in the first two volumes. It means for owners of the original books, there is repetition, but also all the climbs in one place with quite a few new ones too. 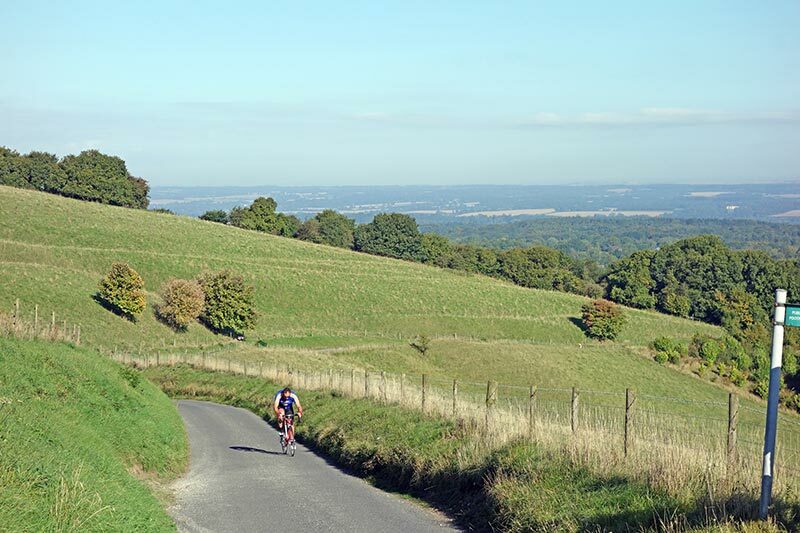 The South East includes Oxfordshire and some of the Chiltern hills I know and ride so often – climbs like Chinnor Hill, Muswell Hill and Whiteleaf. The South East also includes the south coast of Sussex and Kent – somewhere I very rarely cycle. Probably the last time I rode near the south coast was the Brighton Mitre hill climb on Steyning Bostal in 2006. The regional guide didn’t give the same thrill as the first 100 climb book. Because many of the climbs are now well known. But, there are still a few new climbs, I’d not done before. Last week, I checked out Whitchurch Hill- from Pangbourne I’d never ridden around there before, despite being a mere 25 miles south of Oxford. I nice little 3 minute climb with good road surface. Oxford is certainly spoilt for climbs. I will probably end up buying the South West, because Oxford is as close to the Cotswolds as the Chilterns. 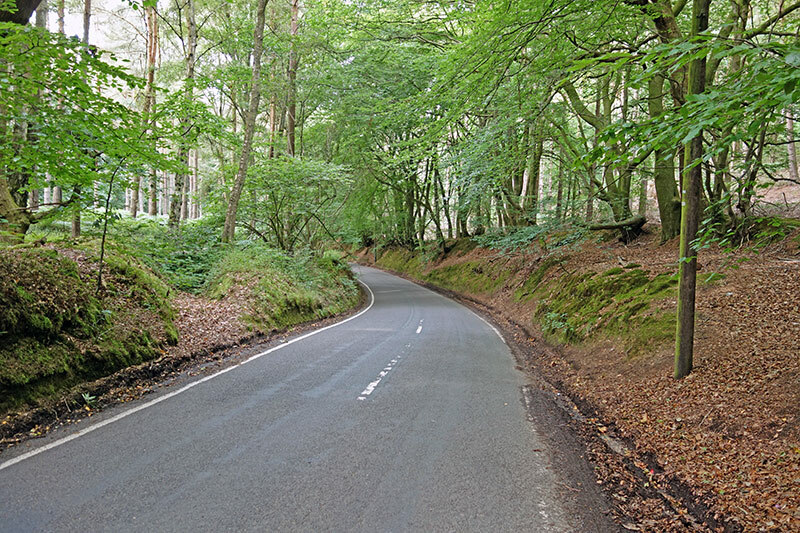 The defining feature of British hills is that they are short and steep. Four minutes of a lung bursting effort of gradients up to 30%. 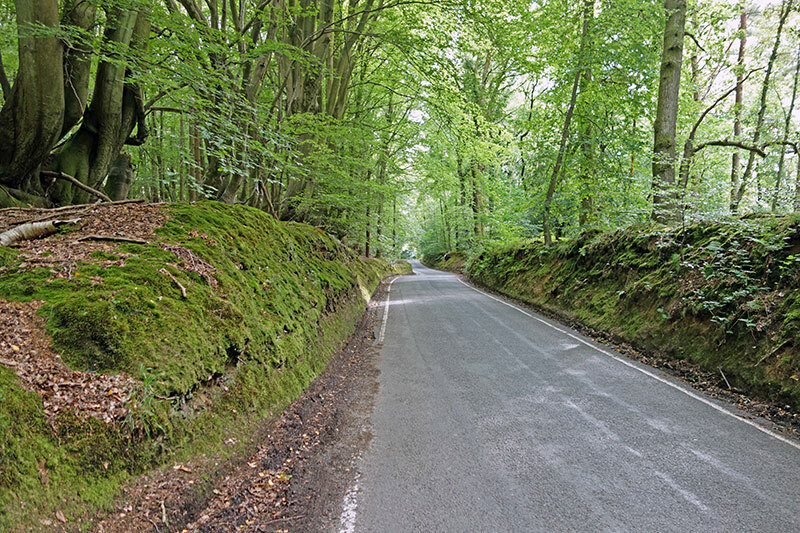 British roads were not built with smooth cycling in mind. 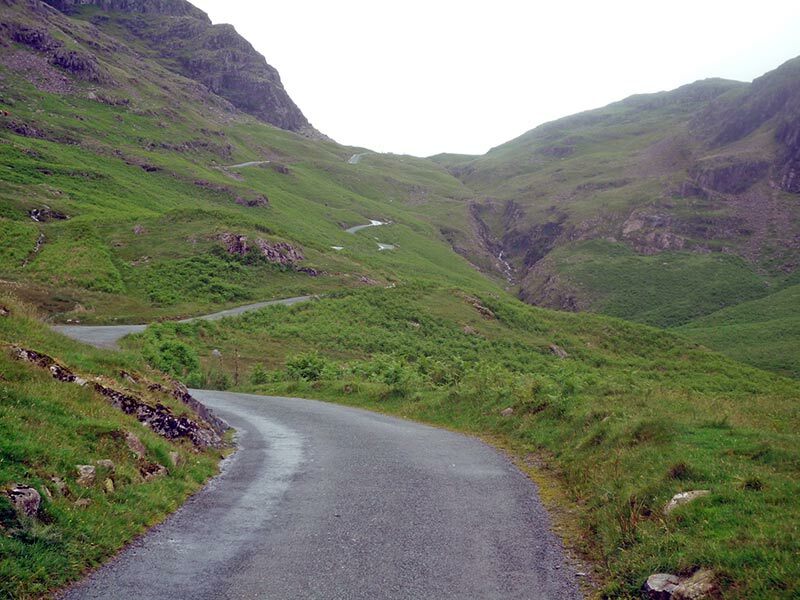 We throw a road on the hill and hope for the best; hairpins are a luxury rarely afforded – at best we may get a quarter hairpin so the gradient is kept below 25%. The gradient is never constant, but nearly always variable. You can’t get into a rhythm but will find you are constantly changing gear or wishing you had a lower gear to go into. To add insult to injury, the road surface is invariably rough and potholes create an added challenge. The Alps and Pyrenees by contrast are wonderfully engineered and manicured climbs. You can have a climb with an average gradient of 8%, but the maximum is 10%. In England, an average of 8%, usually means a maximum of 18-20%. On the continent, the road surfaces are usually something we can only dream of – smooth and well maintained. The other defining thing about the Pyrenees is that the climbs are long 17km, 20km climbs. We just struggle to comprehend how long the hills are. It’s like doing a 10 mile time trial uphill at an average gradient of 9%. Luz Ardiden is a ski resort built in 1975 and has featured several times as a summit finish in the Tour de France. It starts from the same town as the Col du Tormalet – to the north east of Luz Saint Sauveur in the Midi Pyrenees, It is a classic Pyrenean climb – averaging 8% for a height gain of 982m, with frequent hairpin bends. It offers some stunning views from the top. Luz Ardiden near the top. 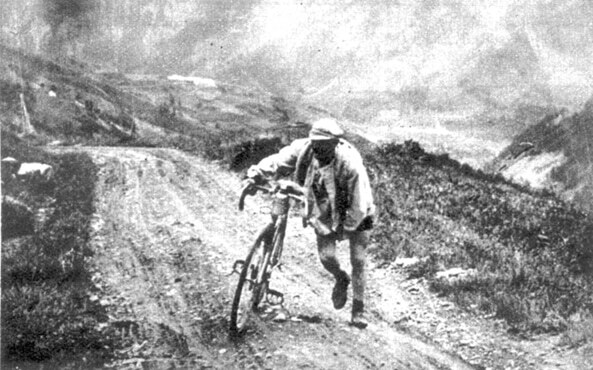 The Col du Tourmalet was first featured in the Tour de France in 1910. 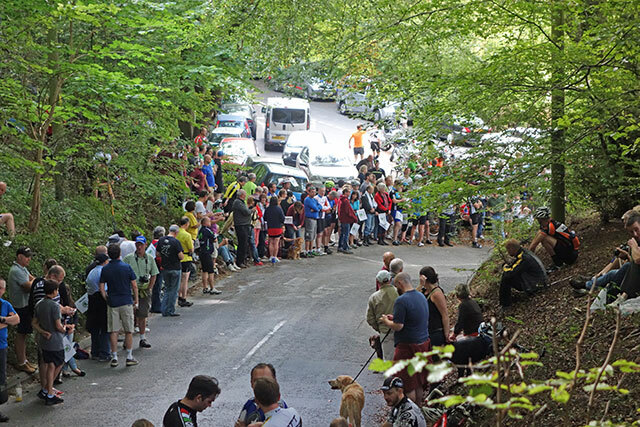 Since then, it has featured in the race over 73 times and is one of the most prestigious climbs on the Tour. The early intrepid riders were climbing poor road surfaces on heavy two speed bicycles; in those days, to climb a Pyrenean pass like the Col du Tourmalet was a herculean task. With lightweight bikes and good road surfaces, it is a little easier than for those early pioneers, but it is still 2,100m to ascend. 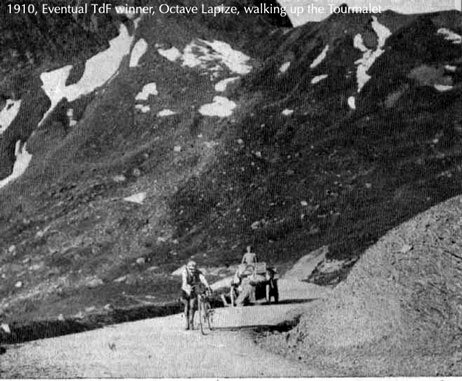 Eventual winner Octave Lapize walking up the Tourmalet in 1910. In the Tour de France, the Col du Tourmalet is often the penultimate climb of the day. It is conveniently situated near many mountain top finishes like Luz Ardiden, Hautacam. 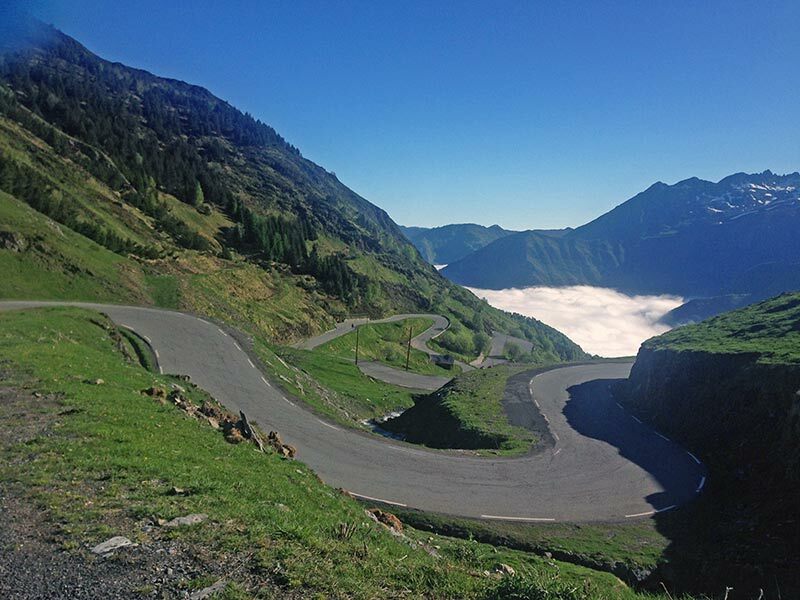 There are no shortage of other climbs in this part of the world. 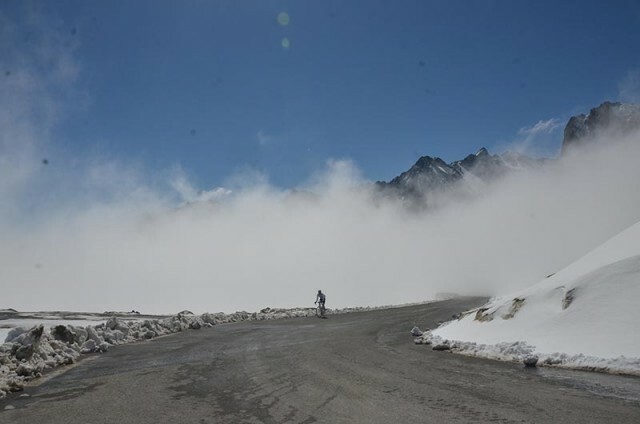 One thing always guaranteed with the Col du Tourmalet is that the peleton will be split into little pieces with perhaps twenty or thirty minutes between the front and back of the peleton.